I am ridiculously lucky to live and work in Washington, D.C. The District of Columbia’s Human Rights Act makes discrimination illegal based on 20 protected traits, sexual orientation and gender identity or expression being some of them. There are still 28 states where you can be fired simply for being gay. If I wasn’t equipped with this legal protection, I wouldn’t have the confidence to be myself around students or the freedom to have the important conversations I have with them each day. In addition to the legal protections that the District provides for teachers, DCPS takes it a step further with their Plan to Create an Inclusive School Community. This plan places trained liaisons in each middle and high school who are responsible for supporting LGBTQ students, staff, and families and implementing programs that make schools more safe and inclusive for students. 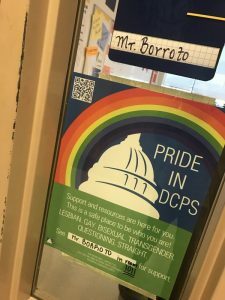 DCPS also plans an annual “Leading with Pride” conference to build the leadership capacity of LGBTQ students and staff. 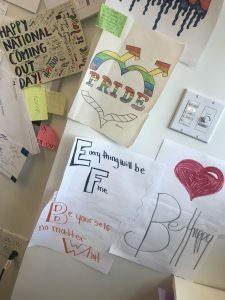 Finally, DCPS has released clear guidance so that transgender and gender non-conforming students are protected in things like using their correct names, pronouns, and restrooms. In the same 2015 survey, 64% of students who reported an incident of harassment or assault said that school staff did nothing in response or told the student to ignore it. Having trained adults responsible for creating inclusive schools is an essential step for making all students feel safe. On most days, being an out gay teacher goes really well. My heart beams when students feel safe enough to come out to me. I am appreciative when one of my students says “fag” by accident but then looks at me in horror and genuinely apologizes: “Mr. B, I am so sorry. 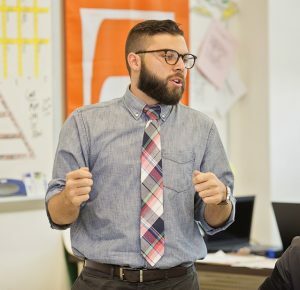 My bad.” I know I’ve gotten through to them when a new student comes into my class using disrespectful language and my other students correct them: “Mr. B doesn’t like it when we use those words.” I’m proud of the conversations we have and the safe environment that we’ve created together. But kids are kids, and no one is perfect. There are some days where being out can backfire. I will never forget her empathy on that day. I work so hard to make my class safe for kids, but when class didn’t feel safe for me, she did what she could to make it better. I look forward to continuing to be a safe space for students and soaking in everything that they have to teach me. Happy Pride Month! You are one admirable young man that has surpassed all fear, discrimination, and at times, insults for your sexual orientation. The fact that you are helping others not to be ashamed of who you are, or for what others might say about you, shows me the amazing caring man that you have become! Your family is very proud of you and I am too!